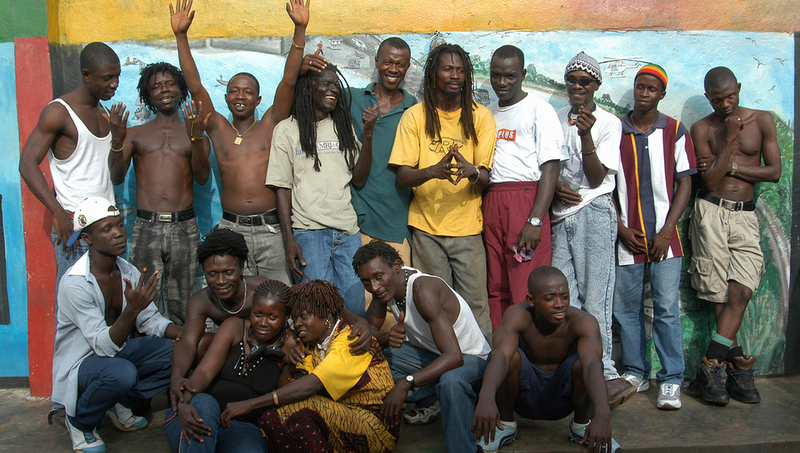 Grab a free download from the terrific “Sierra Leone’s Refugee All Stars” here. Africa’s most inspirational band, “Sierra Leone’s Refugee All Stars,” celebrates ten years together with its finest album to date. Libation’s “around-the-campfire” intimacy, honest soulfulness, and technical prowess reveal how far the group has come while remaining true to its roots. Produced by Chris Velan and mixed by Iestyn Polson, known for his work with David Gray,Patti Smith, and David Bowie, Libation embodies the contagious joy, optimism in the face of struggle and love for their fellow man that has earned the All Stars a devoted following across the globe. After a 10-year adventure that has taken them from the squalor of refugee camps to the world’s biggest stages, Africa’s most inspirational band continues to ascend with what will surely be hailed as their best album yet. For these beautiful recordings,Sierra Leone’s Refugee All Stars go full circle to the acoustic, “around the campfire” sound that appeared on their first album, much of which was recorded in the refugee camps during their years in exile from Sierra Leone. Back then, the group was in a very different frame of mind, had yet to tour the world, and were still raw in their sound. Over the years they have evolved to become one of Africa’s most recognized bands with fans across the globe. Libation‘s acoustic intimacy, toe-tapping rhythms, catchy melodies, honest soulfulness, socially conscious lyrics and musical dexterity reveal how far the group has come while remaining true to its roots. It’s a family reunion as well, as they join forces again with Chris Velan, the producer of their debut album Living Like a Refugee. The new album, which will be released in the US and Canada on March 18, was recorded amidst the Green Mountains of Vermont and mixed in London by renowned British producer Iestyn Polson, known for his work with David Gray, Patti Smith, David Bowie and others. The album takes its title, Libation, from the ritual pouring of a liquid that is common in African cultures. A libation is poured as an offering to a god or spirit, to honor the ancestors, and in memory of loved ones who have died. Often, when a libation is poured it is an invocation for sacred spirits to be present at a special event such as the welcoming of people into the community, for a wedding, birth or funeral or the coronation of a king or other ruler. After the tracking of the album was finished, for example, the members of the band celebrated the occasion by pouring a libation, both as a celebration and to remember the numerous beloved members of the band who have passed away over the last ten years and could not take part in the session. The title offers a celebration of ten years together, a chance to remember those who have joined the ancestors and hope for many years of success ahead. ** Thanks to Ryan from Press Junkie PR for the press release!